b. At its medial end by the reflected part of the inguinal ligament. It is formed by the arched fibres of the internal oblique and transverse abdominis muscles. The floor is formed by an incurving of the inguinal ligament, which is part of the external oblique muscle, forming a gutter. (Medially it forms the lacunar ligament). Is a triangular gap in the external oblique aponeurosis . It is shaped like an obtuse angled triangle . The base of the triangle is formed by the pubic crest, the two sides of the triangle from the lateral or lower and the medial or upper margins of the opening. It is 2.5 cm long and 1.2 cm broad at the base these margins are referred as crura. The fleshy fibres of the internal oblique muscle. The spermatic cord in males, or the round ligament of the uterus in females, enters the inguinal canal through the deep inguinal ring and passes out through the superficial inguinal ring. The ilioinguinal nerve enters the canal through the interval between the external and internal oblique muscles and passes out through the superficial inguinal ring. 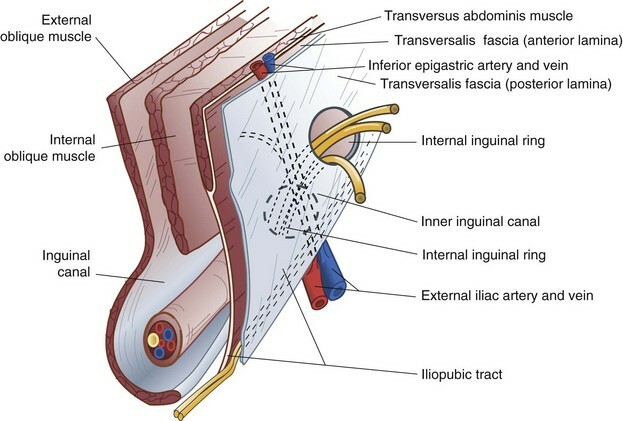 1.The internal spermatic fascia , derived from the fascia transversalis; it covers the cord in its whole extent . 2.The cremasteric fascia is made up of the muscle loops constituting the cremaster muscle, and the intervening areolar tissue. It is derived from the internal oblique and transversus abdominis muscles. 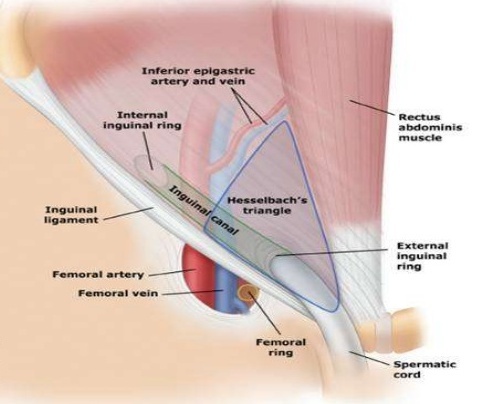 Obliquity of the inguinal canal:The two inguinal rings do not lie opposite to each other. Therefore, when the intra-abdominal pressure rises the anterior and posterior walls of the canal are approximated, thus obliterating the passage. This is known as the flap valve mechanism. The superficial inguinal ring is guarded from behind by the conjoint tendon and by the reflected part of the inguinal canal. The deep inguinal ring is guarded from the front by the fleshy fibres of the internal oblique. Shutter mechanism of the internal oblique: This muscle has a triple relation to the inguinal canal. It forms the anterior wall, the roof, and the posterior wall of the canal. When it contracts the roof is approximated to the floor, like a shutter. Slit valve mechanism of Superficial Ring: Contraction of the external oblique results in approximation of the two crura of the superficial inguinal ring . The integrity of the superficial inguinal ring is greatly increased by the intercrural fibres.